id Software admits that Rage's widespread driver issue was "really, really poorly handled." 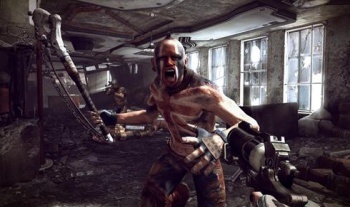 Rage's launch on the PC in 2011 was marred with flaws, resulting in performance problems like texture pop-in and screen tearing. John Carmack, co-founder of id Software, acknowledged these problems in this year's QuakeCon keynote speech and has formally apologized for the shaky release. Carmack dedicated the first few minutes of his speech to a retrospective on the post-apocalyptic shooter before moving on to its troubled PC debut. Members of the audience responded with scattered applause and calls of "thank you" after Carmack admitted that the game had performed badly in the PC space, saying that the entire situation was "really, really poorly handled". "There's no way to, you know, to argue our way out of it one way or another," Carmack acknowledged. "The release on the PC not working for over half of our customers because of the driver issues that we had really was inexcusable on our part." "It was optimistic naÃ¯vetÃ©," he continued. "We tried to get the drivers to work the way they were supposed to, but we weren't smart about the fact that most people wouldn't have these drivers if everything had gone right." He concluded the brief discussion that the company was going to handle these issues better in the future. Carmack also praised the "moment to moment" gameplay in Rage, saying that id did a good job in pushing for a highly responsive, fast action game. On the other hand, he criticized the game's ending and the lack of a checkpoint save system, and believed that Rage "would've been good if we spent some time to get it working right." Despite the game's problems with graphics drivers affecting more than half of Rage's player base, Carmack still has a soft spot for the PC platform: "PC, when its working right, is far, far better."